Changing the oil on another brand is basically the same. The drain tube/plug may be on the side of the bottom of the engine instead of the back. If the oil drain is on the side, I usually put a block of wood under the transmission housing to lift the back of the snow blower off the ground and remove the wheel. That way I can get an old ice cream container right up to the drain tube to collect the oil. Some people put a piece of cardboard down under the used oil container to soak up any drips. If you spill some on your cement floor, oil dry, kitty litter or sawdust all work well to soak up the oil. Put the oil dry on the spill and leave it for 24 hours. If there is a stain left use Dawn/water to scrub the stain. If you have never changed oil in an engine before I want to warn you that if you get it on your hands it can be very hard to get off. The dirt in the oil stains your hands. Wear vinyl gloves. Washing your hands thoroughly with Dawn will usually clean most of it off though. Save the oil. You are going to use some of it in the next two videos. In the video Craftsman suggests warming the engine up before changing the oil. If your work area is 45 degree Fahrenheit or warmer I don’t recommend doing this. Why? Your snow blower engine is designed to run in cold temperatures and should not be run for more than a minute when the temp is above 45 degrees. Instead of warming up the engine, I just set up the container I am draining the oil into on the ground, open the drain, and then walk away for 20 minutes or so. By the way: When I get an empty cooking oil bottle in the kitchen, I use it to store my used engine oil out in the garage. I use the oil for lubricating shafts and when I get too much it is easy to transport to a recycling facility. You don’t need a grease gun to do this task. Any automotive store sells a container of wheel bearing grease about the size of a Planter’s peanut can. One container will last you 10 years. I use a paper towel to wipe the grease on the axle. It is a good idea to do this on your lawn tractor also. That way if you ever have to remove a wheel it will come off easily. Watch the video and look a the picture of the Husqvarna transmission. 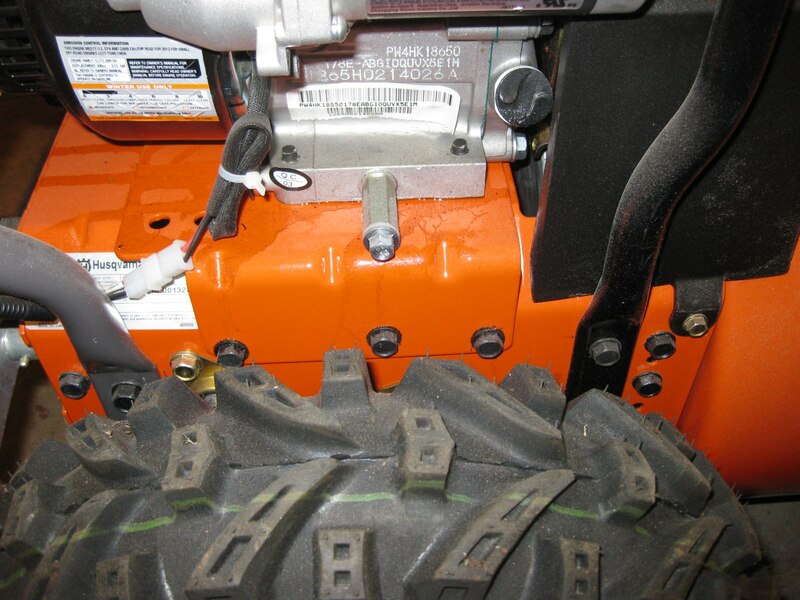 The difference is MTD produced snow blowers use gears to reduce the speed, Husqvarna and others use chains. Here is where you can use the engine oil you drained from your engine. Use that old oil to lubricate the shaft. I use a paper towel dipped int he oil to lube the shaft. Try not to get oil on the big aluminum disk and the rubber “tire”. Oil on those two items will cause your transmission to slip. 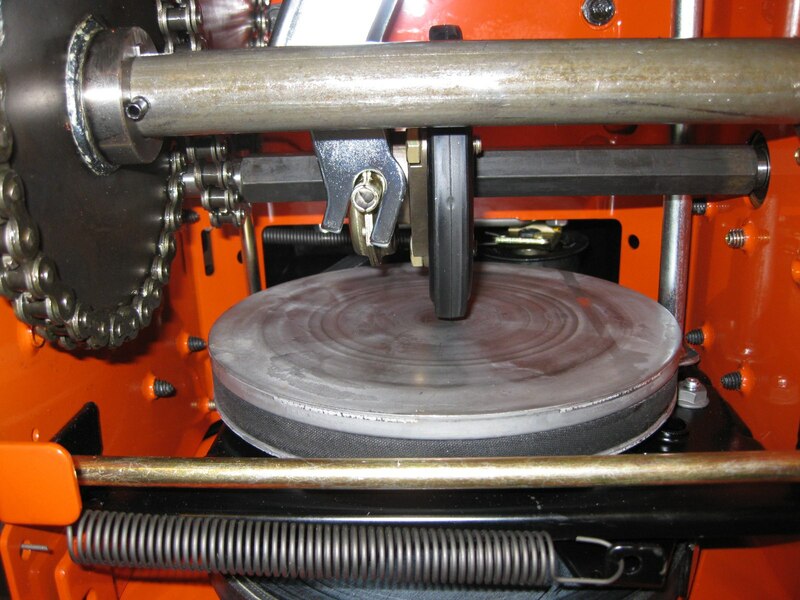 If you want to lay a rag or paper towel on the disk to protect it when you lube the shaft. I suggest when you get the snow blower tipped up and the transmission cover off, put the gear selector in 6. Lubricate the shaft. Then put the gear selector in R2 and then lubricate the other side of the shaft. You can also wipe oil on the gears/chains. 7. Hammer: Any old beater will do…….. including a claw hammer in your kitchen drawer. Hi Paul I have a single stage Craftsman 800snow blower. How do I check the transmission or drive shaft lubricant. Hi Ron, I can’t figure out what a Craftsman 800 is. Would you please reply with the model number off of the tag on the back of the snow blower. Great site, I enjoy reading as much as I can even if it’s not relevant to me. I have a simple question regarding engine oil. I live in central NJ about 10 minutes from Pennsylvania and I have a Craftsman 88173 I bought in March this year that has been used once for about an hour. After a couple more uses (wishing for snow this season) it will be ready for it’s first oil change. My question is: I would like to use synthetic oil for all the obvious reasons, do I need to use a 5W-30 that specifically states for snow blowers? Or can any 4 cycle synthetic 5W-30 do. Even those that only list warm weather machines like lawn mowers/tractors. Also I always thought I should use small engine oil in my small engines, that it is engineered differently than automotive engine oil. Or is there little to no difference and all that matters is the weight (5W-30 is 5W-30) and any will do. Ok, that was two questions. Thank you for your experience and insight. Small gas engines do run at hotter temperatures than a car engine. Push lawn mower engines are particularly susceptible to blowing up when using regular car oil. Most people don’t know or care so they blame the engine…. So if you use regular oil in your air-cooled engine, you always want to use a heavy-duty oil. Rotella Diesel Truck oil, Harley Davidson, and Briggs & Stratton oil are a few examples. These oils won’t break down as quickly under high temperatures as car oil. There is another set of codes on the oil container that tell you the rating of the oil. i.e., SB, SC, SD, SE, SF, SG, SH. You can Google that if you want to learn more. Good synthetic oils like Mobil One and Amzoil have a much higher flashpoint so they won’t break down in your small engine. In addition, synthetics like Mobile One never lose their lubricating qualities. As an example, Mobile One had a semi running around the country that last I heard had 3 million miles on the same Mobil One oil. (They did take the oil out of the truck every 10,000 miles and filtered the dirt out of it,) The engine shows no appreciable wear. I’ve run Mobil One in all my gas engines for over 25 years now and I have never had an engine failure. I’ve run Dodge Caravans over 400,000 miles without them using more than a quart of oil every 6000 miles. I ran Mobil One of all my commercial mowers and hydro units. I never had a failure with them. I change the weight 5W or 10W for the season temperature. 5W-30 is the viscosity, meaning it is thinner when cold which will make the snow blower easier to pull start. You can use a heavier weight synthetic oil but the engine may be harder to start when it’s -20 outside. Just so you know. Most Sears stores now only carry 5W-30 synthetic.